The European WingTsun Organisation was founded by Prof. Dr. Keith Kernspecht to disseminate and cultivate WingTsun in Europe – an until then relatively unknown Chinese Martial Art. Grandmaster Kernspecht became acquainted to Grandmaster Leung Ting in 1975, the highest ranked WT-Master worldwide, and in 1976 invited him on a road show in Germany and many other European countries such as Denmark, UK, Italy, Spain and many others. Grandmaster Kernspecht earned the 10th Master Grade in WingTsun by his teacher, Grandmaster Leung Ting in 2000 – the highest grade possible in WingTsun, making Kernsecht the highest graded WingTsun Master worldwide, together with Leung Ting. This followed an intensive training period in Europe and China that spanned over 20 years. Kernspecht was already an instructor for various Asian martial arts, including over 5 years with other Chinese Wing Chun Masters to the style of Dr. Leung Jan. The EWTO has very high quality requirements as the WT-Training programmes are meant to stand out with an equally high standard throughout Europe. This aim is being successfully achieved through the development and implementation of a consequent and consistent grading programme and examination system. Hundreds of EWTO seminars are offered on an annual basis which secure quality control and guarantee the adoption of the latest teaching set by Grandmaster Kernspecht and his team. The EWTO has legally protected the brand “WT” throughout Europe with the relevant authorities and is monitoring the compliance with these intellectual property rights. Students undertake a path from the first to the 12th Student Grade, the training of which lasts for between two and four years, depending on the level of intensity. There are now more than 60,000 EWTO WingTsun students across Europe, with 20-50% of those students being female, depending on the individual school. After three decades in Langenzell Castle, Grandmaster Kernspecht transferred the Headquarters of the EWTO from Kiel to Heidelberg in Germany and also founded the EWTO Instructors Academy held within the headquarters themselves. Around 90% of all European WingTsun instructors are now trained here. The new premises are located in the heritage protected Landfried building complex, taking up one whole floor. All facilities have been sophisticatedly remodelled to the highest of standards of a modern training and administration centre – brightness, transparency and aesthetic functionality now characterise the new EWTO Headquarters. In order to fully support its training seminars the EWTO publishes its literature at its own publishing house. For example, Grandmaster Leung Ting’s WingTsun Kuen is now on offer in its 19th edition and was translated into six other languages. Grandmaster Kernspecht’s book, On Single Combat – considered for decades as the fundamental knowledge in Martial Arts by professionals – reached its 17th edition in 2012. Furthermore, in his series of books entitled Blitz Defence, Kernspecht, the Professor of Combatology, exclusively explains the phenomenon of ‘the ritual fight’ amongst men. The EWTO not only supervises all its European Country Chief Instructors, but also guides many of their colleagues in other parts of the world with words and deeds. Regular market orientations by the EWTO are emphasised by its state-of-the-art internal communications methods. Regular Instructor mailings inform colleagues about training and tuition offers, as well as updates on the latest topics of interest. The annually published printed member magazine, WingTsun World provides all students a fantastic overview concerning all EWTO activities around the world. Editorials about the latest news in the association are continuously published online all-year-round at ‘WingTsun World Oline’ (www.ewto.com bzw.www.wingtsunwelt.com). 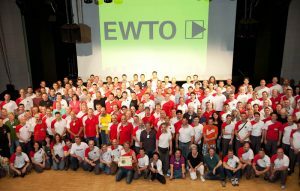 The EWTO department for Marketing and Public Relations offers marketing tools, marketing materials and coordinates all trans-regional WT performances to the public. The EWTO Shop delivers all kinds of training equipment and accessories to all EWTO Schools and Students.